Jobable, a Hong Kong based data-driven career platform, providing job seekers with an easy way to apply to jobs in Hong Kong, has launched a machine learning algorithm, which produces a relevance score for every position unique to each applicant and job opening. 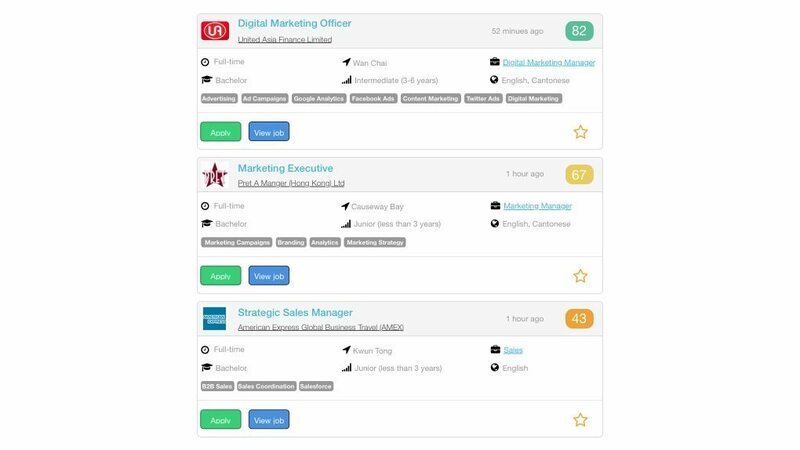 Being called the Matching Score, the platform analyses hundreds of data points from every electronically submitted CV, calculating the scores, this information is then displayed to both job seekers and employers. Once applicants have been scored, Jobable works at recommending the most suitable jobs for the applicant. For example, an applicant might get recommendations for jobs that have never been considered before. 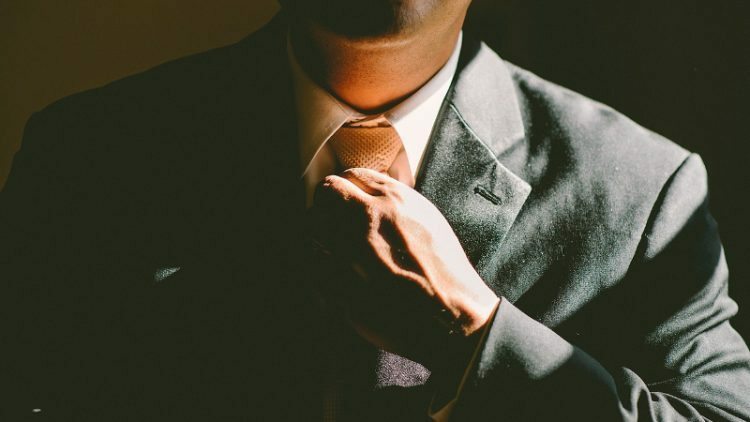 This is because Jobable’s algorithm analyzes the CV and using this algorithm realizes that the applicant is a good fit for the job-requirement. According to the company, this will lead applicants to explore new possibilities with the focus on their relevant roles and employers can also benefit from a higher quality, more relevant application pool. Founded in 2014, the company was in stealth mode, analyzing over 100,000 job descriptions and applicant profiles during the algorithm development process. Post resurfacing, Jobable claims to have built a popular jobs board which has experienced 200 per cent month on month user growth since launching in early 2016. 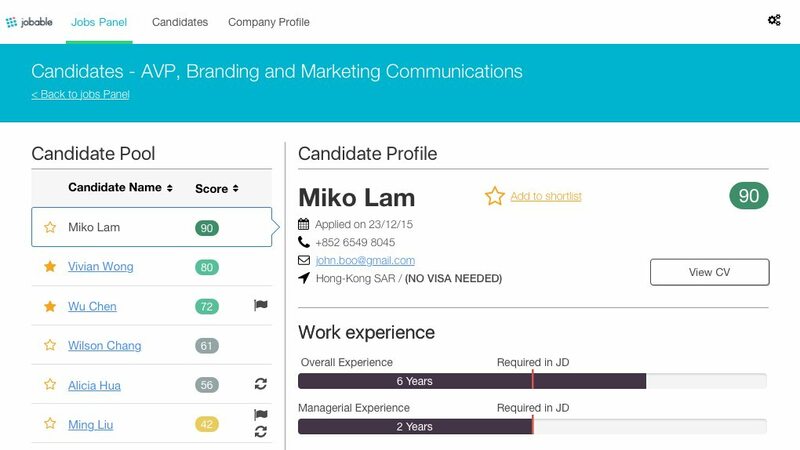 With the launch of Jobable Score, the company claims to be the most advanced jobs board in Hong Kong, if not Asia. During the development phase, more than 50 talent recruiters were rating the relevance of applications for different jobs. Then Jobable’s team of PhD data scientists and engineers looked at those results, as well as other activity on the site, to create the score. Byrne says that the scoring mechanism goes far beyond simple keyword matching, which he considers to be suitable only for the most basic jobs. The company is aiming for Jobable Score to become the ‘go-to’ industry standard that any Asia focused talent pool is initially assessed by. Expansion to other Asian countries is already in the pipeline for enhancing the recruitment process for companies and job seekers more widely. Both Byrne and Hanson are thinking of allowing customers to access the platform and matching score through a public API.